During her time at the White House, Mrs. Obama has led the Let Girls Learn movement and its 62 Million Girls initiative, a campaign which aims to provide opportunities to the millions of girls around the world who are denied the right to education. 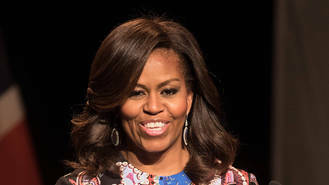 As part of the campaign and in conjunction with Women's History Month, the First Lady has enlisted the help of some of today's top female artists including Missy, Kelly, Zendaya, Kelly Rowland, Janelle Monae, Lea Michele and newcomers Chloe & Halle and Jadagrace for a track called This Is For My Girls. The mid-tempo tune, written by Oscar nominee Diane Warren, includes the lyrics: "This is for my girls all around the world/Stand up and be heard... Stand up, hold your head up, don’t take nothing from nobody." The song will be available for purchase on iTunes on Wednesday (16Mar16). All the artists waived royalties and fees to participate on the project, and all proceeds will go towards the Let Girls Learn Fund. Wednesday's release coincides with the First Lady's appearance at Austin, Texas' annual South By Southwest Music Festival, where she will give the keynote address. She will be joined by Missy, Diane, and actress Sophia Bush, as well as Queen Latifah, who will moderate the discussion focusing on the importance of girls' education. Chloe & Halle, who are signed to Beyonce's Parkwood Entertainment, will also be on hand to serve as the opening act. Mrs. Obama's address comes five days after her husband President Barack Obama participated in a discussion about technology and innovation in government during the South By Southwest's Interactive conference.